Hortense Hoelove has returned just in time to answer a few questions of the season! I recently sent some flowers to someone to cheer them up. While deciding what to order, I looked at some arrangements which included lovely foliage plants with cut flowers mixed in and thought how if I ordered those, I might be asked to take the foliage plants at some point. You see, the recipient isn’t one to have a bunch of houseplants, so she would be looking for someone to take the plants off her hands once the cut flowers had wilted. Thus, ordering a planter seemed like it would give me something, too, eventually. Is it wrong to think this way? I can certainly understand your desire to put yourself in a position to get some “free” foliage plants. However, this kind of plant lust could backfire on you. After all, what if the recipient decided to give the plants to someone else instead of you? 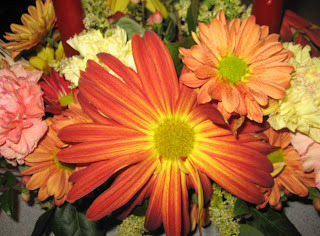 I would stick with giving flowers that you think the giver would want to receive and go buy your own houseplants. A flower arrangement without live plants. Is there a holiday decorating scheme or occasion for which painted poinsettias would be appropriate? I’ve seen some for sale this past week and have been trying to think how or when to use them, and I keep drawing a blank. I figured if anyone would know where and how to use painted poinsettias, it would be you, dear Hortense. No, there is no decorating scheme or holiday occasion for which a painted poinsettia is appropriate. Poinsettias should be enjoyed in their natural colors, which basically are anything in the “red” color spectrum, ranging from red to pink to cream. Those darn painted poinsettias again! Real or fake what? I can only assume that you are referring to Christmas trees when you ask that question at this time of the year. While I generally like to see real trees, I understand the convenience of artificial (the term I prefer over fake) trees and I admit that I have one. They do have some advantages – they don’t dry out, don’t require you to keep them watered, and often come with the lights already attached. However, what do you do with them when you grow tired of them? You throw them out and then forever more, they exist in a landfill. Real trees, on the other hand, are a renewable resource that can be composted after the holiday season. However, they can dry out prematurely, becoming a fire hazard, and require watering for as long as they are inside. They also never come with lights installed. In addition, some people with allergies may not be able to enjoy a real tree indoors. Whether real or fake, a Christmas tree isn’t fully decorated until it has a little hoe on it. A little hoe on a Christmas tree. Dyed orchids make me feel like puking. I've seen the purple and white Dendrobium Sonia orchids dyed blue and it looks ghastly! I love Hortense and Dr. Hortfreud and all the other characters who show up in your dream garden. Right now I am having a Giveaway of Nan Ondra's new book and I'm hoping other Hortense lovers will come over and leave a comment. Drawing on Sunday, the Feast of St. Nicholas. Hortense, So glad you are back to writing your column! I'm glad to hear you think those dyed poinsettias don't fit into any decorating scheme--I think they're scary. I just have one question for you today--where can you buy one of those little hoe ornaments? I don't have a little hoe for my tree! Whatever will I do? DEATH TO PAINTED POINSETTIAS!!! Also in the realm of some kinda awful, I noticed the live Christmas trees for sale which had been spray painted green! A sort of unhealthy strange bluish shade of green. It was quite wretched. Although I always feel bad about causing the cutting down of yet another tree each year, I must admit I love real Christmas trees. There is no substitute for that spicy, piney smell filling the house! Thank you Hortense, for another entertaining edition of questions and answers. 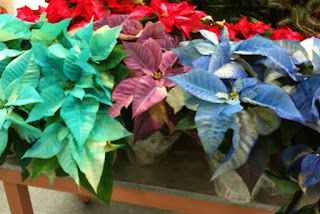 I clearly don't get out much, as I have never seen painted poinsettias. Yuk! I do love real Christmas trees, but am allergic to them. This makes decorating a painful exercise followed up by copious quantities of Benadryl cream and lots of itching. In recent years we've opted for an artificial tree, and do our part for the environment by carefully packing it away at the end of the season and re-using it year after year. Since ours is not a trendy model, nor one with pre-attached lights that might eventually burn out, we anticipate using the same one for many years to come. If we're lucky we'll never have to throw it away to languish in a landfill. Those painted Poinsettias are just WRONG. I'm so glad that you, Hortense, are a fellow believer in the traditional colors for Poinsettias. Actually, there might be a use for those wretched painted poinsettias. Do you have someone you don't particularly like (okay, detest), but feel obligated to give a gift for political reasons? Voila! Painted poinsettia finds a home.